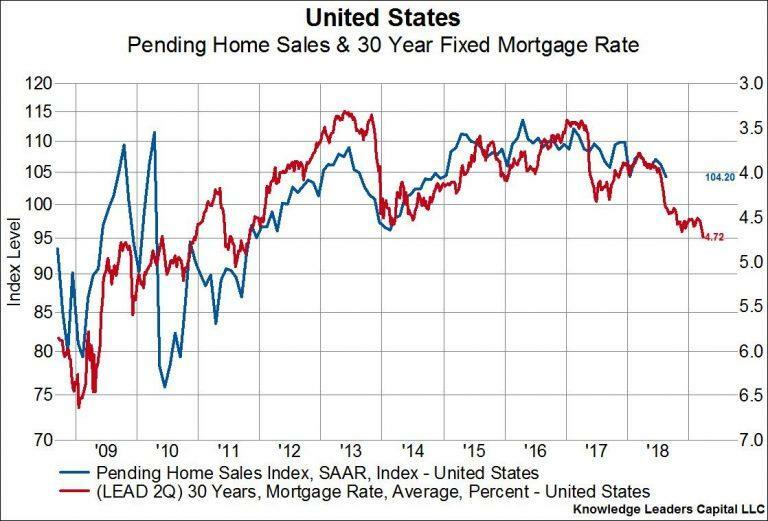 In the first chart below we show pending home sales (blue line, left axis) overlaid on the 30 year fixed mortgage rate (red line, right axis, inverted, leading by 2 quarters). As we can see, pending home sales are closely inversely related to the level of mortgage rates, and rates lead pending home sales by about two quarters. The breakout in mortgage rates we’ve seen over the last few months portend more weakness in pending sales. 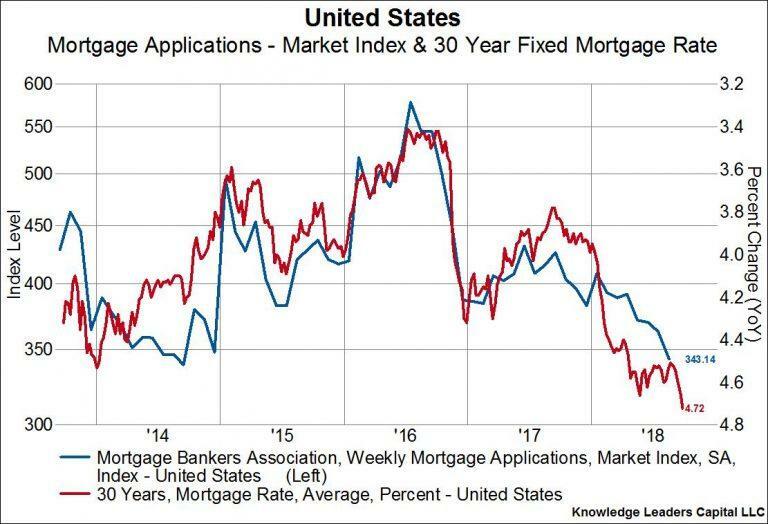 The next chart compares mortgage applications (blue line, left axis) to the 30 year fixed mortgage rate (red line, right axis, inverted) and shows that these two series are also closely inversely related. Higher rates are slowing demand for financing and demand for overall housing. Not exactly a heroic observation, but an important one nonetheless. 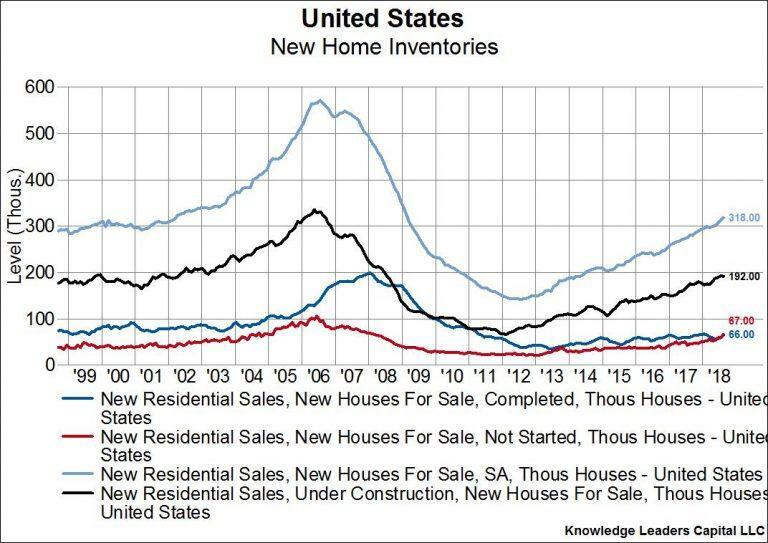 The home builders seem to have caught on, as we would expect. 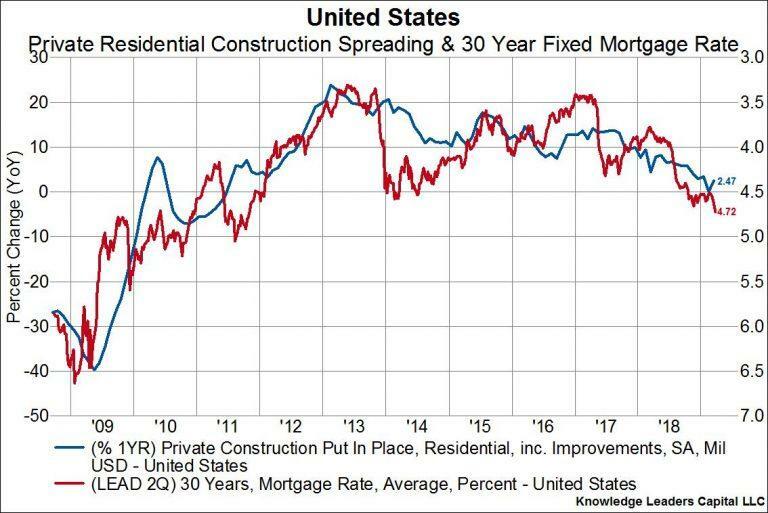 In the next chart we show the 1 year change in private residential construction including improvements (blue line, left axis) compared to the 30 year fixed mortgage rate (red line, right axis, inverted, leading by 2 quarters). As rates have moved higher this year, new home construction growth has slowed to just 2.5% YoY. If rates are any indication, new home construction growth may turn negative in the months just ahead. To be fair, everything housing related isn’t that bad. Inventory levels, even though they have moved up a lot over the last several years, are still at reasonable levels and well shy of peak bubble levels of 2005-2007. Even so inventory levels may no longer be supportive of housing action. And these moderate levels of inventory have helped keep prices stable, for now. 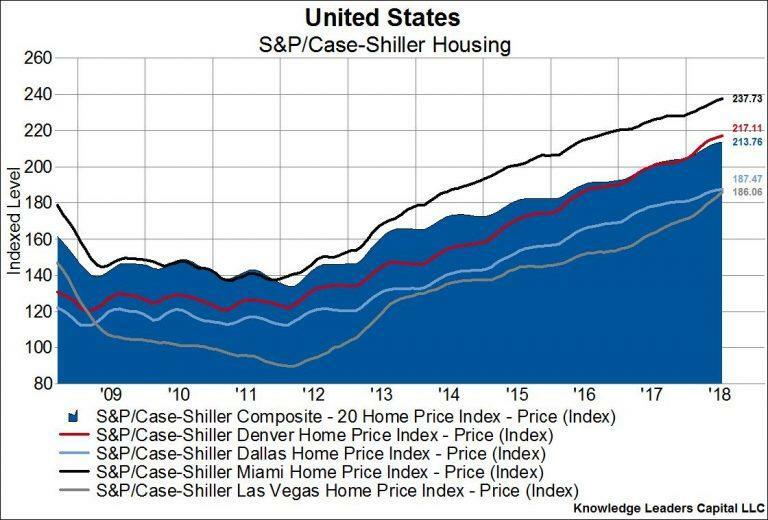 But, housing affordability is taking a nosedive. Here we show the National Association of Realtors housing affordability index (blue line, left axis) against mortgage rates (red line, right axis, inverted, leading by 1 quarter). Up until a few months ago housing affordability was well above trend. But now we’ve moved back to into the range which prevailed from 1991-2004. In sum, the effects of higher long-term interest rates are starting to be squarely felt in the housing space. Pending sales, mortgage applications and new construction have all been weak and look set to get even weaker in the quarters to come as the lagged effects of higher mortgage rates set in. Home prices have yet to respond since inventory levels are still moderate, but inventories aren’t the support they were just two years ago. 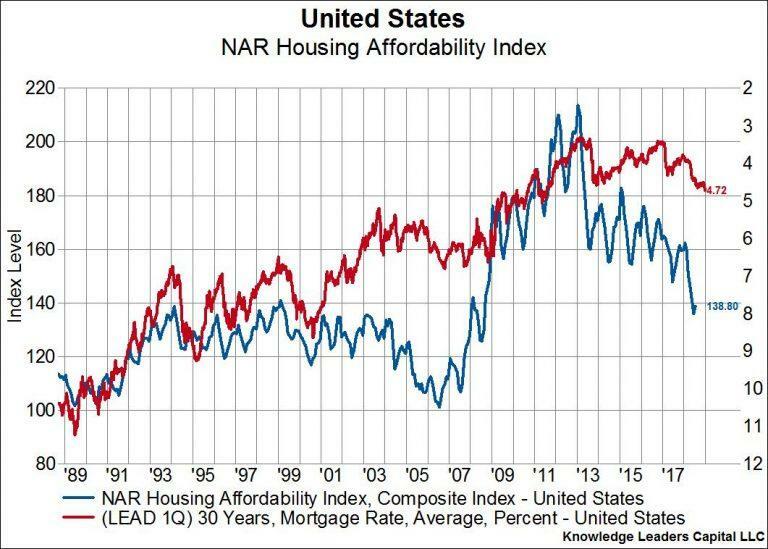 Meanwhile, affordability levels are no longer very supportive. All this suggests that the housing sector, which has been a bright spot of this recovery over the last five or six years, may not be the same source of wealth accumulation and growth over the next few years, or as long as higher mortgage rates continue to take the juice out of this sector.